The last few weeks, I have made this pasta dinner for a few times! Why? Because it is asparagus season! That means that the white gold is back in town! 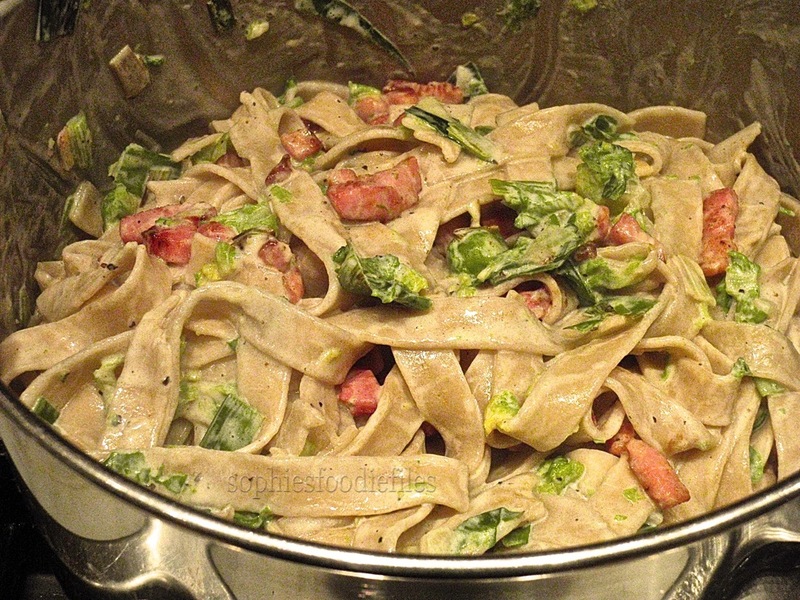 Lovely succulent fresh white asparagus pasta with a few simple ingredients. 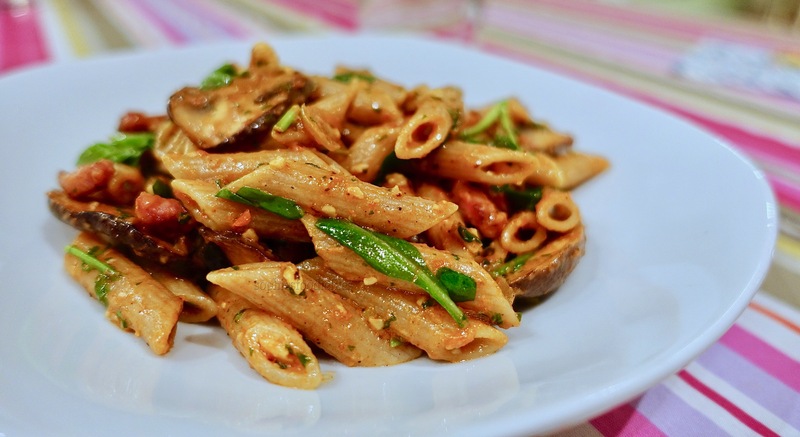 It is a super healthy pasta dinner & it uses only 4 basic lovely tasty ingredients! Let’s guess! 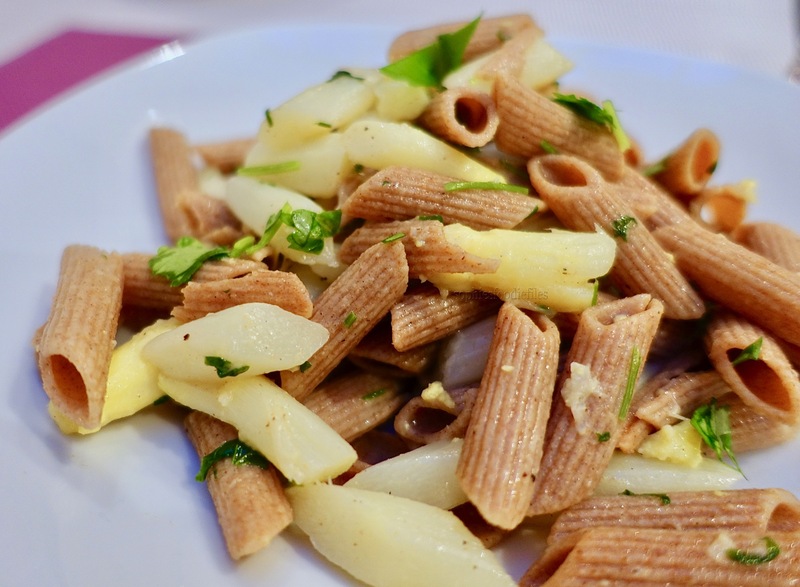 I used wholemeal spelt penne, fresh butter, fresh flat-leaf parsley & white asparagus! Ooh yes, so simple, very easy yet delicious to make! Let’s begin with the tasty recipe! Take a large cooking pot & fill with cold water. Place your cut up asparagus in it. Place fitted lid on & bring the water to the boil. When it is well boiling, set the timer to 8 minutes. Boil your asparagus for 8 minutes or until just al dente when pierced with a fork. Taste with other pieces too. Drain well but keep about 150-250 ml of the cooked asparagus water. In the same pot, heat of a few knobs of butter. 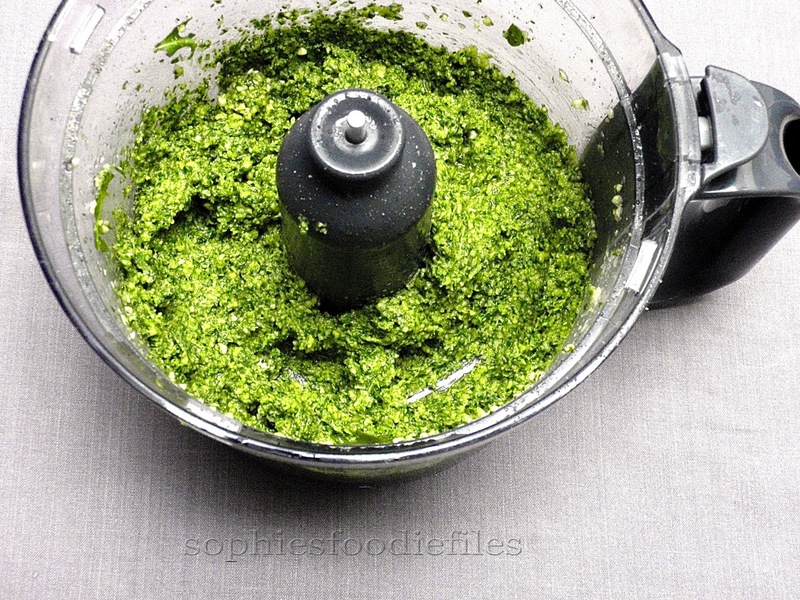 When hot, add drained asparagus & the cut up parsley too. Carefully with 2 hands, shake your pot up & round so that the melted butter & parsley have coated the asparagus. See that the asparagus are hot too. Season with some finely milled black pepper & some salt too but not too much! Keep warm. At the same time, cook your pasta until al dente. This was 8 minutes. Drain well. Add the butted aspargus-parsley to the warm pasta & stir round carefully in the pot trying not to break the cooked asparagus! Add some of the cooked asparagus water just enough until you get a bit of a sauce. Season again if you need to. Subscribe By Email + Get Free E-Book: Healthy Vegan Christmas! Join 1,800 email subscribers! It is free! ♥ Stay Tuned & subscribe by email! Click the photo link here below to subscribe!!! Treat yourself to my Free E-Book: Healthy Vegan Christmas! 10 new unpublished recipes of me & 8/10 are also gluten-free! I have a version for a Mac, iPad, iPhone. Just click onto the photo to subscribe! A few days ago, I harvested our 2 first yellow courgettes from our garden! I also harvested spring onions & fresh rosemary! 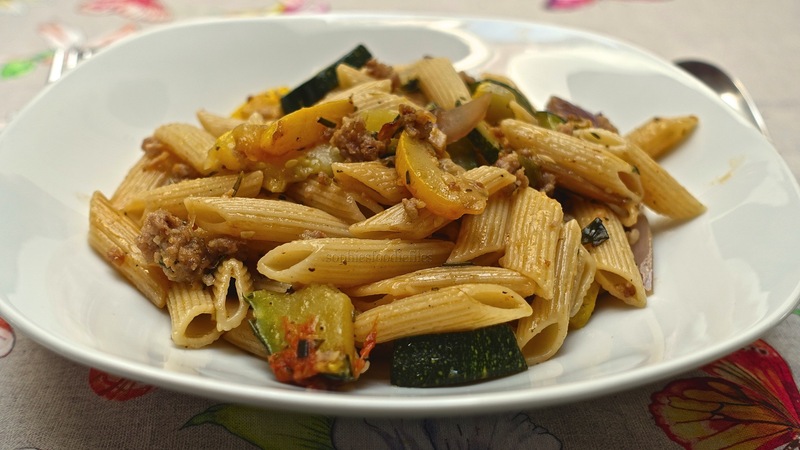 That is why, I made this delicious easy seasonal pasta dish! 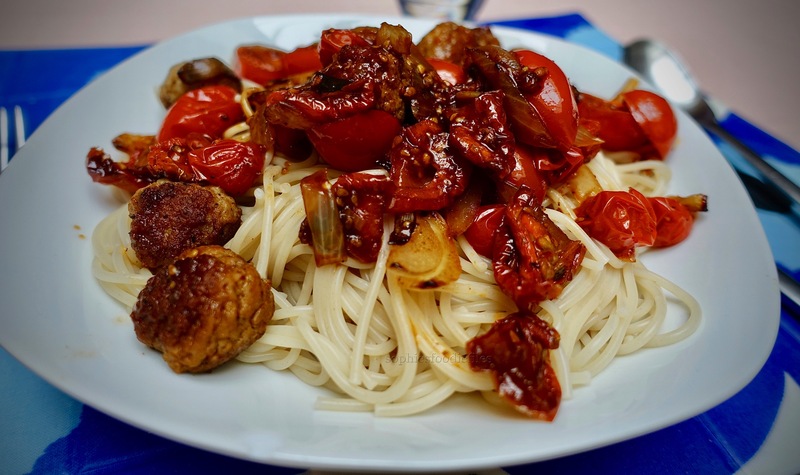 You can make it gluten-free by using GF pasta in here! You can make it vegan by using tofu mince or seitan mince. It is up to you! Enjoy! 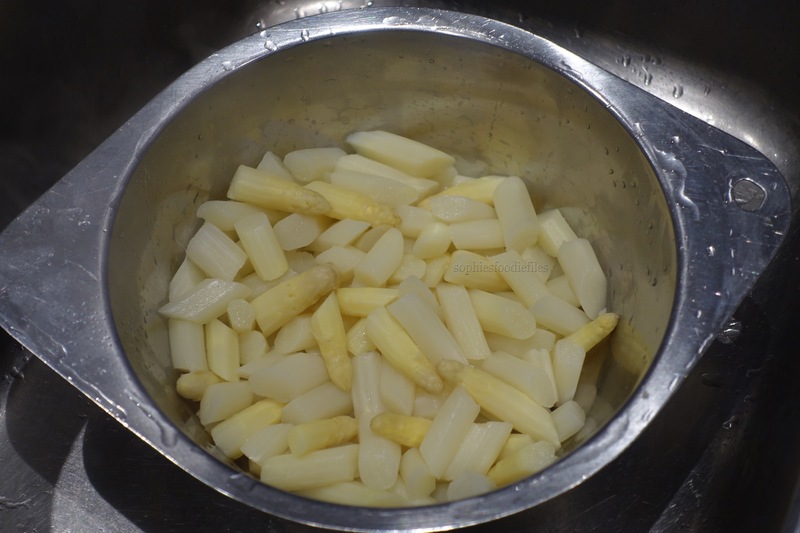 Cook your spelt penne according to your packet instructions & drain. Keep warm. Take a large frying pan & heat up on medium-high. When hot, add a few drizzles of that fruity oil. Add chopped garlic, red onion slices, spearing onions & 1/2 of the chopped rosemary fry for a few minutes, stirring often. Season with some black pepper & some salt. Now, add chopped green & yellow courgettes & the other 1/2 of the chopped fresh rosemary & fry further for about 5-10 minutes or until al dente. Season extra with some black pepper & some sea salt according to your taste. Keep warm. At the same time, take another frying pan & heat up onto high heat. when hot, add a few drizzles of that same fruity oil & heat up. Now, add pork mince & fry until cooked through. this took me about 8 minutes. Season with dried mixed Provençal herbs, black pepper & some salt. Mix everything together. When all done, mix the mince & veggie mix through the hot pasta & check seasoning on last time. Plate up & enjoy with a loved one! 😉 MMM! First, cook your spelt spaghetti according to your packet instructions. it took me 8 minutes. Drain & keep warm. Now, heat up a fitted non-stick pan on medium heat. Pour a bit of that same fruity oil in it & heat up. Add onion slices & tomato halves. Fry until done & cooked through. Season with some black pepper & some pink salt, but not too much! 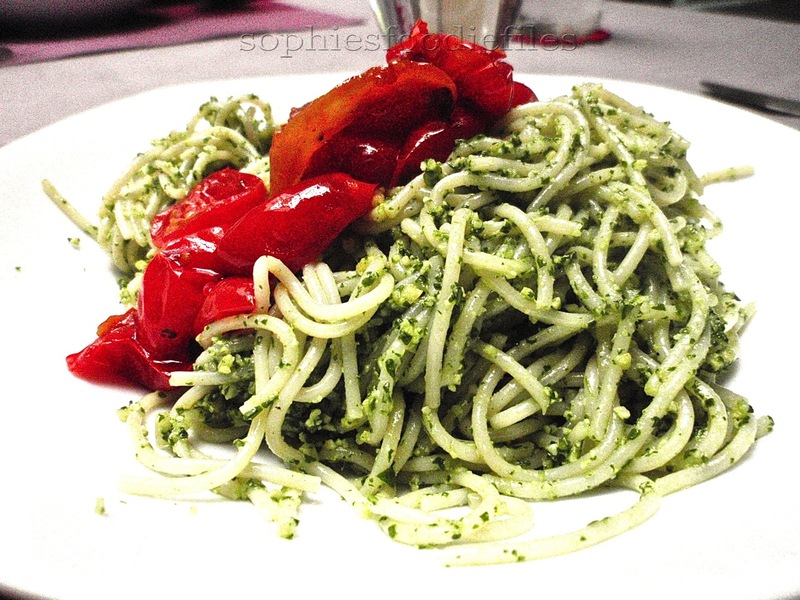 Stir thicker pesto through the cooked pasta & mingle everything together well. Check seasoning on last time. Now, plate up, like photo above! The sweetness of the tomatoes go so well with the rocket cashew combo! To die for really! Healthy too! 🙂 A must make! yum yum yum!Like what you see & want to stay updated through email? Join 1,850 email subscribers now!!! It is free!!!! A few days ago, I biked to our beloved allotment. 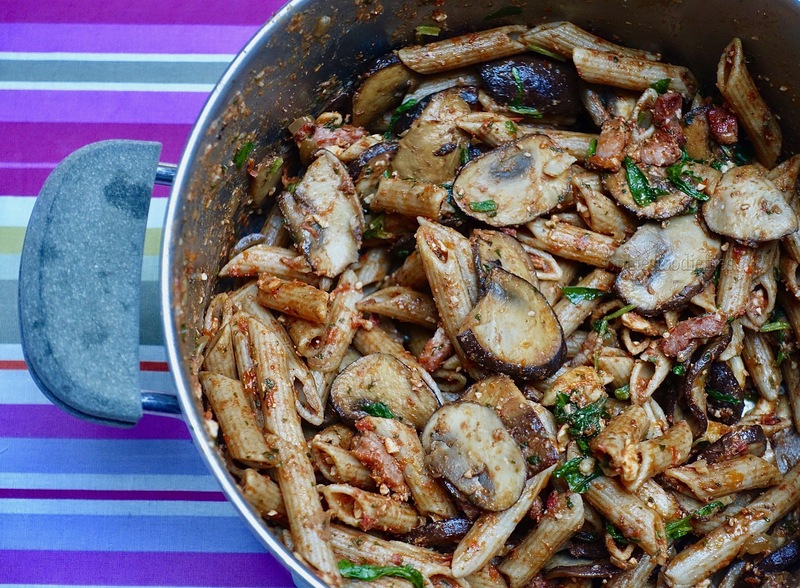 I harvested a few of my winter veggies & used them in this lovely pasta dinner. 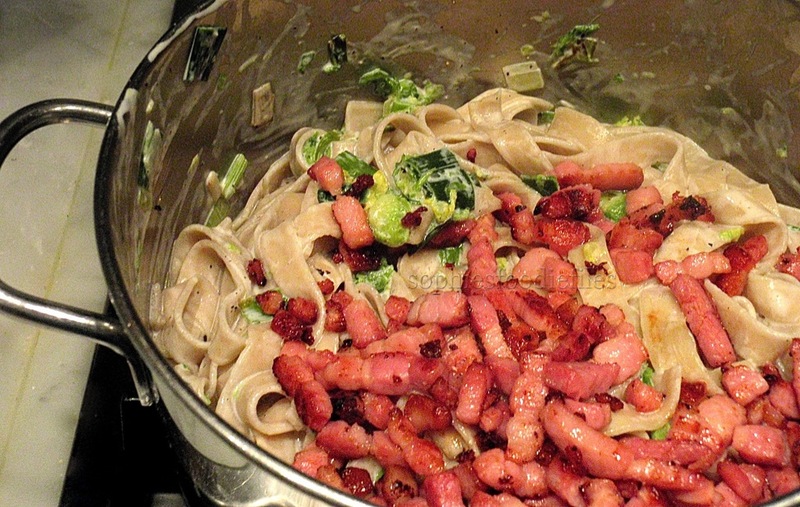 It is creamy, yet very lovely with our winter veggies & we added smoked bacon pieces to the meal, to give extra yummyness! 😉 You see what I mean? 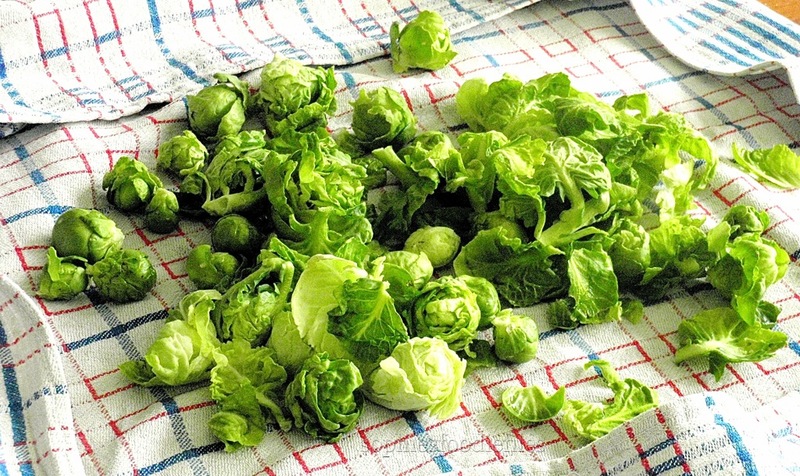 We had 2 Brussels sprout plants but they didn’t give us many sprouts in October. We left them under the net & placed 2 winter fleeces over it during the Winter months. Now, it was time, to clean up the garden & remove the net. I ended up with about 250 gr Brussels sprouts. They had all sizes but so fresh & green looking! The last of the Brussels Sprouts! I added a few other veggies from the garden to the pasta dish. Doesn’t it look quite yummy? Cook your pasta according to the packet instructions. My tagliatelle needed 7 minutes of cooking. At the same time, fry your smoked bacon pieces until browned on all sides into a large frying pan with that same fruity evoo. Drain fat. Keep warm. Just coming out of the oven! Yesterday evening, I invented & made this lovely vegetarian lentil lasagna! It is a very filling lasagna with a home-made pasta veggies sauce. I also added 4 tablespoons store-bought red pesto to the sauce for extra flavor, of course! 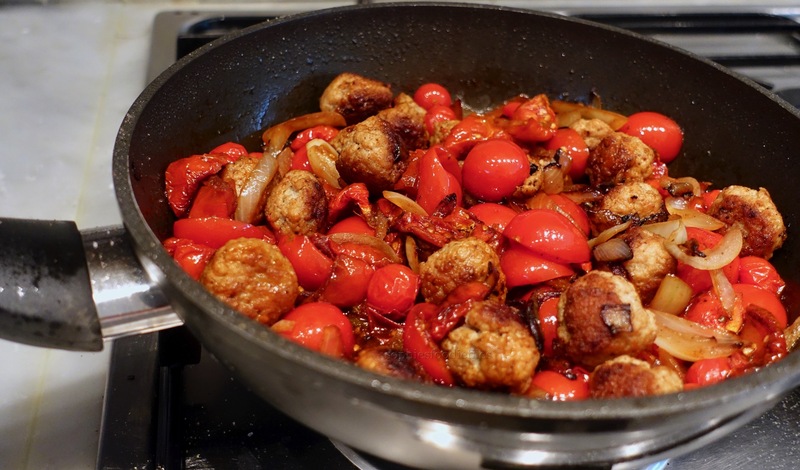 This sauce would be ideal to make completely vegan by serving it with vegan chorizo sausages or making the lasagna completely vegan by using vegan shredded cheese on top! It is that adaptable & simple! Yes! Recipe: For 1 medium oven dish full of lasagna = 4-6 big portions! 5-6 spelt lasagna sheets, uncooked! First, make your tomato veggie sauce. Take a large cooking pot & add some drizzles of that fruity extra virgin olive oil. Heat up on medium heat. When hot, add chopped garlic, onion, red sweet pepper strips & torn basil leaves. Fry for about 10 minutes, stirring often. Then, add chopped courgette & carrots, stirring often. Season with some black pepper & some sea salt. Fry until nearly tender. Now, add green lentils, tomato paste, tomato passata, red pesto & hot veggie stock. Stir everything round into the pot. See that your lentils are all covered within the sauce. Turn your heat lower so that the sauce will thicken & your lentils will get cooked but not too hot. It all must simmer though! After 10 minutes or so, stir everything well round into the pot & stick besides the pot because you don’t want the lentils & sauce to get burned. Check often & stir often too. It is better that your sauce simmers then that it will burn! After 15 of cooking, my sauce got too thick & I added 150 ml of hot water to the thicker sauce. Stir well through & simmer further for another 15 minutes or until your lentils are just cooked & your carrots are cooked through. You want your lentils to be just perfect! That means just cooked, just tender all the ay through! No mushy lentils, thank you very much! 😉 Taste. I added about 15 grind of black pepper & about 10 pinches of salt to the thicker sauce. Stir well. Preheat your oven to 180°C (350°F) for 10 minutes. Take your lasagna oven dish. Mine was: 20 cm x 25 cm. Place 1/3 of your sauce in the bottom of your lasagna dish. Top with 2 spelt lasagna sheets & 1/2 of a 3rd one. Top with 1/3 of the sauce. The lasagna sheets must be completely covered by the veggies sauce. Then, top with 2 sheets & 1/2 of a 3rd one. Now, smear the last third of the sauce over the sheets. Finally, scatter your grated gratin cheese all over the surface of your lentil-veggie sauce & place in the lower end of your oven & bake for 30 minutes! 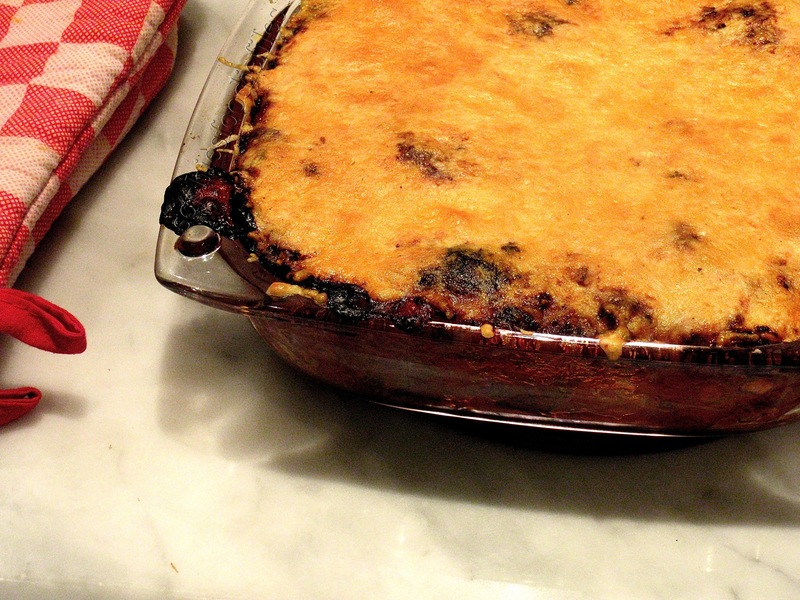 You will end up with a lovely gratin of cheese on top of your lentil lasagna! Your house will smell amazing when you open your oven door! ooh yes! Take out of the oven & wait for 10 minutes before serving! Otherwise your lasagna will be too hot to enjoy the yummy flavors!!! My husband thought this as the best home-made lasagna ever!!! 10/10! This is great for entertaining! 🙂 Enjoy, sweeties! We begin: 1/3 of the sauce! 2 spelt lasagna sheets + 1/2!